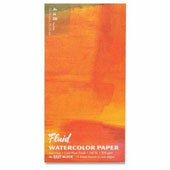 Fluid Watercolor Paper: 4x8 Cold PressA high quality and affordable watercolor paper block, Fluid Watercolor Paper comes from a 1618 European mill, produced in small batches and at slow speeds. For Easy Paper blocks, the papers are glued on 2 edges which holds the top sheet flat and allows for easy removal. This block consists of 15 sheets of 140lbs /300gsm hot pressed watercolor paper for a textured surface ideal for holding water and blending. This paper is excellent for water-based products such as The Craft Wave Aqua Fan and Molotow Aqua GraFX. A high quality and affordable watercolor paper block, Fluid Watercolor Paper comes from a 1618 European mill, produced in small batches and at slow speeds. For Easy Paper blocks, the papers are glued on 2 edges which holds the top sheet flat and allows for easy removal. This block consists of 15 sheets of 140lbs /300gsm hot pressed watercolor paper for a textured surface ideal for holding water and blending. This paper is excellent for water-based products such as The Craft Wave Aqua Fan and Molotow Aqua GraFX. This product was added to our catalog on Tuesday March 19, 2019.